The Queensland Fire and Emergency Services (QFES) is today hosting a professional development workshop with disaster managers from 15 Pacific Island countries to help strengthen the region’s ability to best respond to disasters. The training has been organised in partnership with the Pacific Islands Emergency Management Alliance (PIEMA), focused on strengthening emergency management across the region by creating sustainable, long-term partnerships with agencies like QFES. PIEMA is implemented by the Pacific Community (SPC) and funded by the European Union’s €19.37million ACP-EU Building Safety and Resilience in the Pacific Project. SPC Disaster Reduction Programme Manager, Dr. Paul Taylor said, “The predictions for the region show disasters will increase in strength and we’ve seen this kind of devastation already in recent months with Cyclone Winston. 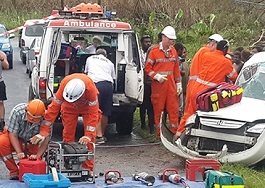 Partnerships like the one with QFES are critical because they genuinely help support emergency management teams in the Pacific to save lives,” he said. The European Union Ambassador to the Pacific, H.E. Andrew Jacobs, commended the work of Pacific Island emergency managers tasked with the role of protecting their communities from the impact of disaster. Queensland Fire and Emergency Services Assistant Commissioner Neil Reid said the commitment to our Pacific neighbours was critical to building safe and more resilient communities. “QFES is proud to support our international counterparts with the provision of professional development training and resources. Partnerships such as this are a tremendous opportunity to share knowledge, information and cooperation to improve response during emergencies and disasters,” he added. The training is a culmination of PIEMA’s biennial meeting held as part of the 2016 Emergency Management Week where the new Strategic Agenda for PIEMA was launched (SA2020). This training, involving disasters managers from Fiji, Vanuatu, Papua New Guinea and other Pacific locations, is one of the first steps to making this strategic plan a reality supporting increased emergency management while protecting more lives from the impact of disaster. The training today will consist of urban search and rescue, creating common management systems and helping support national accreditation of best practice emergency service response for Pacific Island countries. The Pacific Islands Emergency Management Alliance (PIEMA) is made up of the Regional Disaster Managers Meeting, Pacific Island Fire and Emergency Services Association and the Pacific Island Chiefs of Police. PIEMA is funded by the ACP-European Union Building Safety and Resilience in the Pacific Project (BSRP) implemented by SPC. BSRP is a EUR 19.37million project funded by the EU and implemented by SPC.